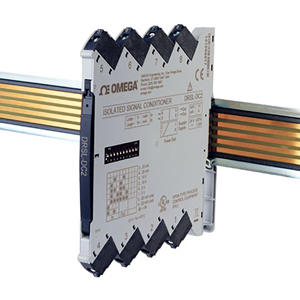 The DRSL-DC2 isolated DIN rail signal conditioner provides a competitive choice in terms of both price and technology for galvanic isolation of process voltage or current signals to SCADA systems or PLC equipment. The DRSL-DC2 can be used for signal conversion of standard process voltage or current signals. The unit offers isolation between input, output and supply, provides surge suppression and protects control systems from transients and noise. The DRSL-DC2 also eliminates ground loops and can be used for measuring floating signals. Low power consumption facilitates DIN rail mounting without the need for any air gap. Factory calibrated measurement ranges are easily configured via DIP switches. When the input is configured for 2-wire transmitter mode, the DRSL-DC2 provides the current loop supply voltage. The unit operates over a wide temperature range from -25 to 70°C (-13 to 158°F).